I recently had a discussion at work concerning chewy versus crunchy chocolate chip cookies. A co-worker of mine is pro-crunchy, while I am most definitely pro-chewy with crunchy edges. And yes, this is all vital information to know in my workplace. In the end, the discussion just made me crave a chocolate chip cookie, so I excused myself for a break and headed down the block to Joe in Grand Central Terminal. I knew they carried This Chick Bakes before Brownie discovered their whoopie pie, but it was only recently that my afternoon mind could recall this on a regular basis. Lucky for me, this day they had chocolate chip cookies left! For $2, this is a good size cookie. 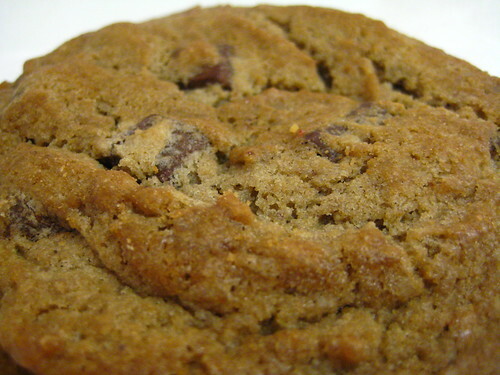 It has a slight coffee taste, and loads of chocolate chips. Inside the chips create flat layers of chocolate, an aspect I prefer. It's also incredibly chewy, almost to the point of underbaked. It was everything I need in an afternoon snack. Delicious treats from This Chick Bakes can be found all around NYC. Click here for the nearest location. I'm a huge proponent of the chewy variety....I'd eat a cracker if I wanted it crispy. Yes, it's cookie week! As a Seattleite I think it carries a lot of weight for me to give the absolute seal of approval to JOE--I love them. 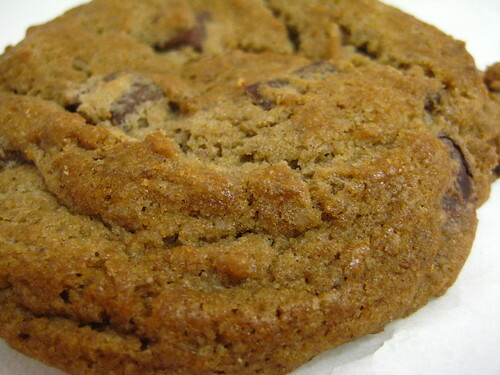 I've got to seek out one of these cookies next time I'm in the city in September!